Recently expanded vacation chalet & renovated kitchen in the midst of the Seneca Lake Wine Trail with lake views in a wooded setting. Located in Hector, NY, just eight miles north of Watkins Glen, on the east side of Seneca Lake. This five bedroom, three bath year round home sleeps 10 - 12 and features wood floors, great room with fireplace, and 700+ sq. 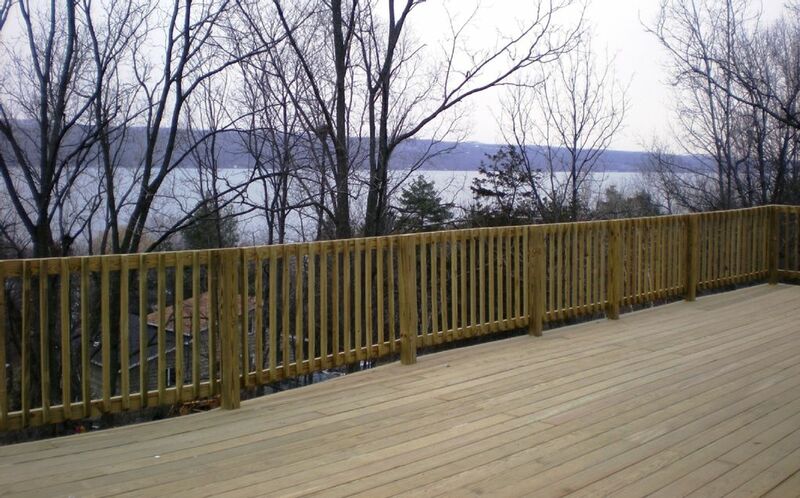 ft. deck with beautiful lake and sunset views. The living space, two bedrooms and two baths are conveniently located on the main floor. Upstairs includes a large bedroom/playroom and a sitting loft with spectacular lake views and overlooks the great room. Walkout ground floor features two bedrooms, full bath & rec room. Beach access short walk down hill. After a day visiting the 11 wineries within a few miles, or hiking in Watkins Glen or the Finger Lakes National Forest, escape to this quiet getaway to enjoy a glass of New York wine on the deck, read a book or visit with friends. Thank you for sharing your home with us. We had a great time. The place was just like the pictures lead us to believe. It was clean and very accommodating. The parking was a little tricky but we were expecting that. This is an annual event for us and we hope to stay again in the future. We came with a group of 12 and really enjoyed how spacious the house was. Plenty of beds, bathrooms, two living areas. Only downfall is the very steep driveway and lack of parking but we made 4 cars work. The owner was very accommodating on our arrival time. The kitchen is well stocked with any utensil, pot, pan, bowl you may need. A nice large deck was great for our first night stay when the weather was nice. Fun filled weekend with friends at a large beautiful house. Wonderful view of the lake. Beautiful large house that comfortably fit our group. Perfect location right in the heart of our wine tour. Would highly recommend to anyone. A family group of eight adults spent the weekend in the Watkins Glen area. We enjoyed visiting some of the wineries and breweries. This property was perfect for us. The location is great and the view of the lake is outstanding. We cooked at the house and the well-stocked kitchen was appreciated by all. The beds were comfortable and living space was ample. The owner (Paul) was very responsive to any questions. I highly recommend this property rental. Everything was perfect. Central location made it easy to visit 2 lakes. The house had every appliance you need to cook. The neighbors were great. Thanks Paul for letting us stay. hope to see you again zoon. The only complaint I have at all is there were no chairs by the firepit, everything else was great! plenty of space, fully stocked kitchen, comfortable bed, deck was large enough to accommodate all 8 of us for dinner outside. So glad you were comfortable in our home and had a great time. Sorry about the lack of seating at the fire pit. I assume guests will do what my kids do, and drag a few chairs off the deck. [will look into getting a few patio chairs to leave down by the fire pit. Hope to see your group again in the near future. Located on the east side of Seneca Lake, 8 miles north of Watkins Glen, home of the International Race Track, Watkins Glen Gorge & State Park, and Seneca Harbor Park. In the heart of the Seneca Wine Trail, 11 wineries and a brewery are within a 10 minute drive, and four within walking distance. Discover the award wining New York State wines. The area has a wide selection of dining options, ranging from casual to elegant. The region contains eleven pristine glacier –carved ice-blue Finger Lakes, all surrounded by gorges hiding over 1,000 waterfalls, rolling hills with hundreds of vineyards, dozens of white-water streams, more than 25 State Parks, including Buttermilk Falls, Taughannock Falls, the Finger Lake National Forest and a world-famous Wildlife Refuge. A hikers paradise! Within 40 minutes is Ithaca, a unique college town with musical venues, international cuisine and children’s and natural museums, and Corning with the renowned Museum of Glass and Rockwell Museum of Western Art.